The last leaf has fallen from the maple trees in front of our house. The green grass is slowly turning to brown as cold air settles in to stay. November is here. As the wind whirls dead leaves around me, it would be easy to assume that the middle of November here in the Midwest is lifeless. There are no green leaves on the trees; brown clematis vines rattle against the lamp post; impatiens have wilted away from frostbite. Everything seems quite dead. 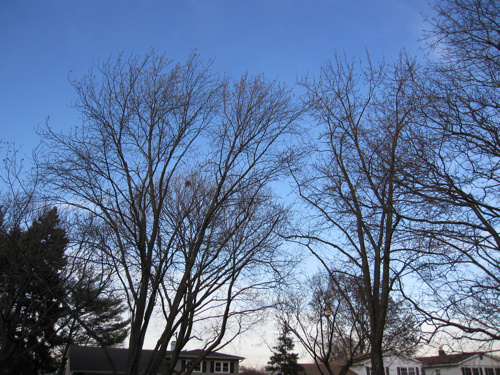 The brisk winds have blown all the leaves off the trees. But wait! 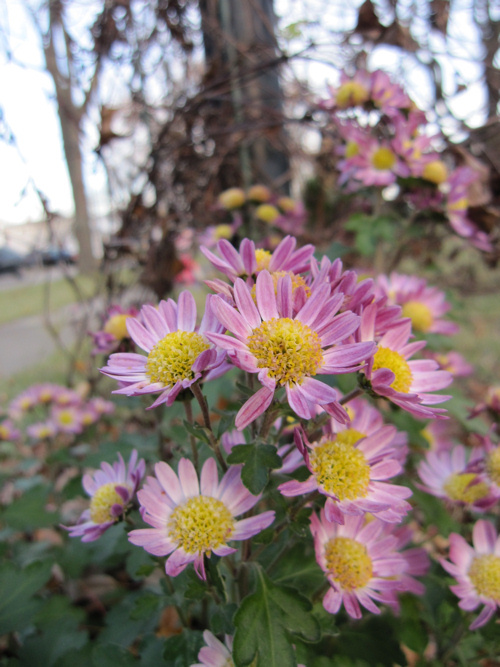 Just below the clematis skeleton are purple chrysanthemums, still colorful and able to withstand the light frost the past few nights have seen. 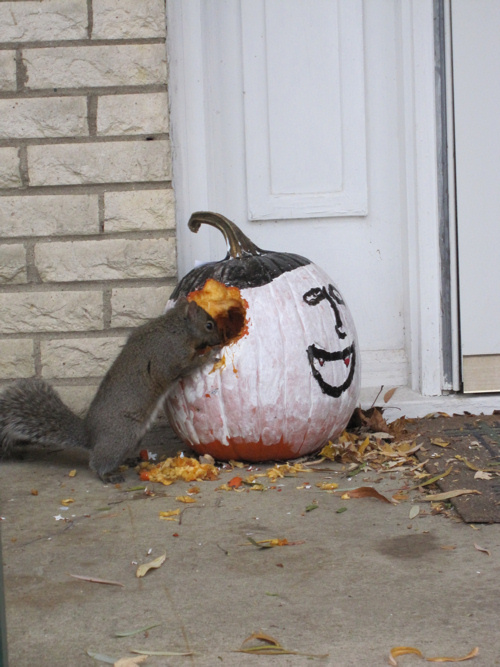 A fat brown squirrel stubbornly chews away at a pumpkin. He knows what treasure awaits him inside, and when he finally gets to those pumpkin seeds, he carries away each seed to help him stay plump. 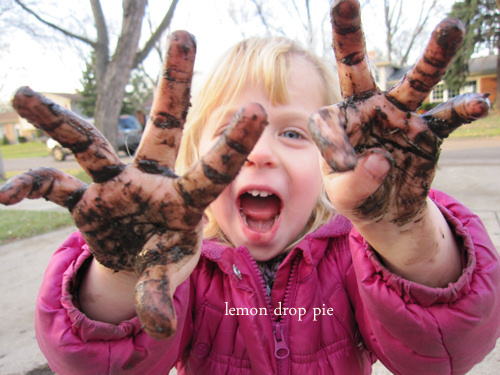 The ground is not yet too frozen for mud pies, as my two little girls discover. The chill in the air is not enough to keep them inside! As I think about all these things, I am reminded of the trip my father took this weekend. He drove up to Minnesota and visited a quiet place where my mother is buried. I can imagine the silent stones overlooking the small lake; the cold Minnesota wind whistling over the hill, making that place seem indeed lifeless. That must have been how the women at the tomb felt on that that early Sunday morning, as lifeless as the tomb in front of them. But wait! Just inside the lifeless tomb are two angels! They are certainly not lifeless, and neither was our Lord when He rose on that third day! Today we celebrate Christ the King Sunday, and as we remember that wonderful day when He rose from the grave, we are reminded why He is the King of Heaven and Earth. And when we reach that heavenly shore, we will wonder why we thought death was lifeless, because that thought couldn’t be farther from the truth of eternal life that Jesus brings. Amen! This was an awesome post, Ginny. Thank you for reminding us that our Lord is alive and in each one of us. And it is His power we draw on each morning if we are to remain positive with an optimistic outlook on life (as you wrote about in today's post :)). It has a chilly look which is definitely November in the air. Hope your fathers drive went well.Thank you for the beautiful reminder of the reason for the season. It is getting cold here. Our pumpkins will be taken to the woods after Thanksgiving. I hope they become food for squirrels or other creatures!